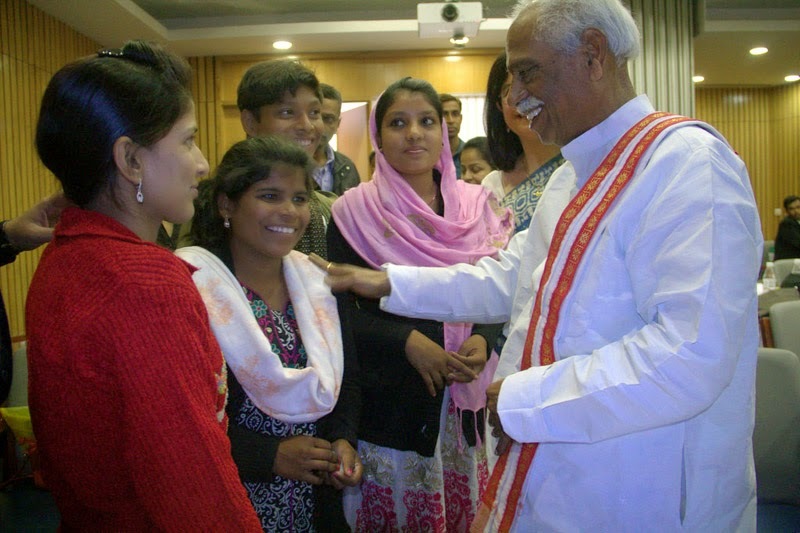 The Minister of State for Labour and Employment (Independent Charge), Shri Bandaru Dattatreya meeting with the children at the National Consultation on Child Domestic Work and Trafficking, in New Delhi on December 09, 2014. A National Consultation on Child Domestic Work and Trafficking was organized in New Delhi by Save the Children to examine issues and concerns of Child Domestic Work and Trafficking with a view to suggest policy changes in specific reference to the Child Labour (Prohibition and Regulation) Amendment Bill, 2012. The Union Minister for State (IC) Labour and Employment, Shri Bandaru Dattatreya delivered the key note address. 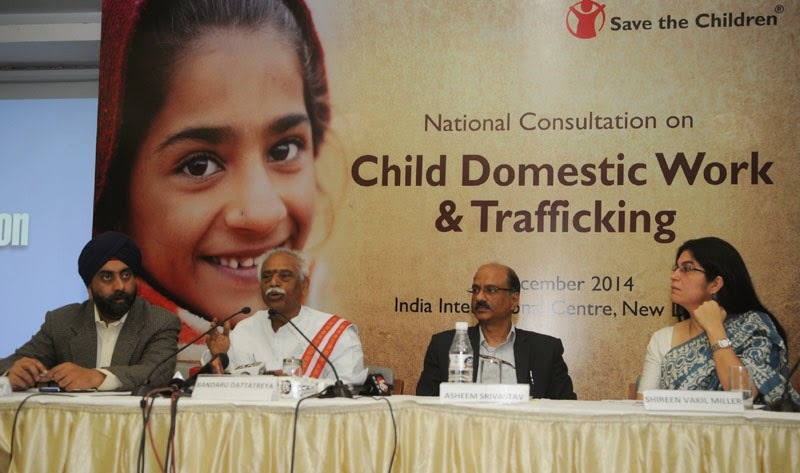 The Minister of State for Labour and Employment (Independent Charge), Shri Bandaru Dattatreya addressing the National Consultation on Child Domestic Work and Trafficking, in New Delhi on December 09, 2014. The Minister informed that amendments to the proposed Child labour Act has been introduced in Rajya Sabha and hoped that it will be passed. The amendment proposes to completely ban child labour upto the age of 14 years. The penalties for any violation of the provision of the proposed Law are being made more stringent. The Minister for Labour & Skills, Kerala, Shri Shibu Baby John and the Member of Parliament from Kollam, Shri N.K. 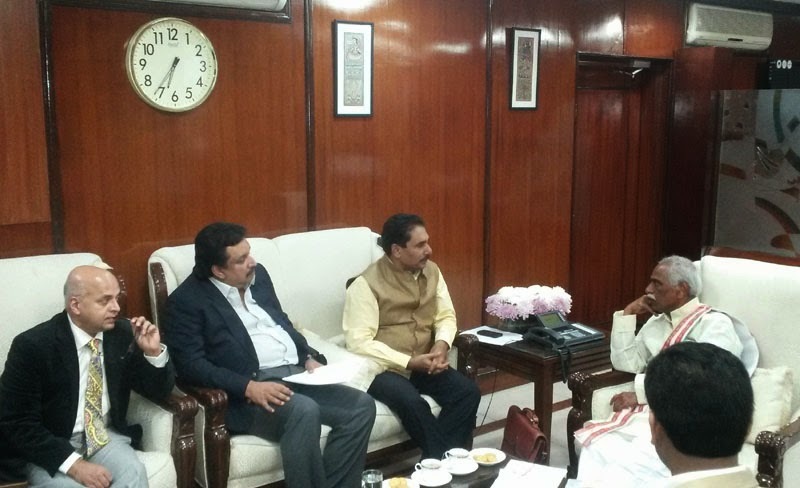 Premachandran calling on the Minister of State for Labour and Employment (Independent Charge), Shri Bandaru Dattatreya, in New Delhi on December 08, 2014. The proposed amendments also provide for not allowing adolescent between the age 14 - 18 years to work in hazardous occupations and processes. He also emphasized on strict implementation of the law. The Minister also informed that the rescued children between the age 9 – 14 will be rehabilitated by providing by them bridge education and skill training in special training centres. The children between the age 5 – 8 years are sent to main stream schools after being rescued. The Minister exhorted the need for greater involvement of all including society, NGOs to eradicate child labour. He informed that the Government is determined to protect the interests of the children and ensure all the children go to schools. A flexi-MoU was signed between Ministry of Labour & Employment, Government of India & Apparel Training & Development Centre (ATDC), in Gurgaon today. The MoU was signed between Shri. Alok Kumar, Director General, Directorate General of Employment & Training (DGE&T) and Dr. Darlie Koshy, Director General/ CEO, ATDC. ATDC under the aegis of Apparel Export Promotion Council (AEPC) has emerged as India’s Largest Vocational Training Network for the Apparel Sector with around 175 ATDCs including 65 ATDC Vocational Institutes and over 135 ATDC- SMART Centres and Skill Camps present in major Apparel clusters spread across 22 states & 85 cities Pan India. The overall objective of the MoU is to provide for a framework whereby ATDC can run employment oriented training to the youth on National Level. The MoU will allow ATDC to run customized courses in association with large apparel export houses and leading domestic manufacturers which shall also be approved by National Council of Vocational Training (NCVT), will facilitate the candidates to get NCVT certificates. The MOU will help in three ways, firstly, it will cut short many impediments in nationwide implementation of the skill based programs. Secondly, it will focus on changing technology being incorporated in courses and lastly more focus on longer duration program with support of DGE&T by tuning with industry inputs. ATDC will get freedom in developing such courses wherein theory portion of the courses can be taught in the training centre and practical in the industry . Special feature of the MoU is that ATDC will ensure employment of 80% of the candidates in a batch. DGE&T has already entered into such MOUs with Maruti Suzuki India Ltd and TATA Motors in Automobile Sector, Labournet in Construction sector, Raymond in Textile Sector, Cadila in Instrument Mechanic sector, Gujarat Industries Power Company Ltd in Power Sector. This MOU will compliment DGET and ATDC capabilities to reach and achieve a common goal of skilling India. The Appointments Committee of Cabinet has approved the repatriation of Shri Arun Kumar Sinha, IAS (UP:83), Additional Secretary, Ministry of Labour and Employment, to his cadre. The total approximate earnings of Indian Railways on originating basis during 1st April 2014 to 30th November 2014 were Rs. 100622 crore compared to Rs. 89341.26 crore during the same period last year, registering an increase of 12.63 per cent. The total approximate earnings from goods during 1st April 2014 – 30th November 2014 were Rs. 67130.96 crore compared to Rs. 60144.16 crore during the same period last year, registering an increase of 11.62 per cent. The total approximate revenue earnings from passengers during 1st April 2014 – 30th November 2014 were Rs. 28510.24 crore compared to Rs. 24523.71 crore during the same period last year, registering an increase of 16.26 percent. The approximate revenue earnings from other coaching amounted to Rs.2669.55 crore during April 2014 – November 2014 compared to Rs. 2515.78 crore during the same period last year, registering an increase of 6.11 per cent. The total approximate numbers of passengers booked during 1st April 2014 – 30th November 2014 were 5581.33 million compared to 5662.54 million during the same period last year, showing a decrease of 1.43 per cent. In the suburban and non-suburban sectors, the numbers of passengers booked during April 2014 - November 2014 were 3022 million and 2559.08 million compared to 3028.44 million and 2634.10 million registering a decrease of 0.20 per cent and of 2.85 per cent respectively during the same period last year.